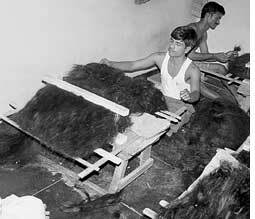 in 2003, the government ordered the closure of several hair processing units, which made wigs, in Karnataka because of pollution. Burning of hair resulted in toxic elements, which caused allergies. The problem with human hair is it takes hundreds of years to decompose (see 'In distress', Down To Earth, July 15, 2003). In 2004, researchers in Punjab found a method to convert the seemingly indecomposable hair into organic manure with the help of earthworms. The process is called vermitechnology. Now, four years later, the researchers have received a patent for the process in India. "It was said that hair does not decompose. I was not convinced. I tried out various methods and zeroed in on vermitechnology in 2004," said R K Kohli of the Centre for Environment at Punjab University. Explains Kohli, who carried out the study with other researchers: hair contains keratin, a fibrous structural protein that is hard and insoluble in most substances. Keratin makes it difficult for hair to decompose easily. He says that an enzyme in the gut of the earthworm breaks down keratin. While working on right conditions for vermitechnology, the researchers found that it worked best without using any chemicals or diluting it. The technology is a multi-layered process where decomposable matter such as wheat husk, bamboo leaves and sawdust forms the base. A mixture containing cow dung and hair is placed on the base. This is topped with more cow dung. A dough is made out of this mixture and kept in shade at temperatures varying from 21-31C. Earthworms are released into it and left for two months to produce the compost. Though this is the first instance of documentation of this technology, experts working on traditional knowledge in agriculture say farmers in some parts of India do convert hair into organic manure. "Farmers in India have tried this method successfully but their contributions have yet not been documented," said Pankaj Oudhia, convenor, International Parthenium Research News Group, a group of researchers who discuss ways and means to manage the weed parthenium. Kohli has plans. "I have requested barbers to store hair. It could be collected at intervals and used for the production of manure instead of disposing it," he said. Also, perhaps the hair processing units could make use of this technology to avoid pollution. Having taken care of the hair issue, the researchers decided to try out the same technology on parthenium, the problem weed. It produces about 10,000 seeds per plant, which propagate fast. It causes dermatitis and allergies. Using a method similar to that of decomposing hair, the researchers found that parthenium degraded completely in 40 days. A problem that arose during the process was to terminate the extremely high seed potential of parthenium. "Vermitechnology could not decompose the seeds. We let the seeds germinate and kept the manure with the germinated seeds in a dark room for about 15 days. This wilted off the seedlings and terminated the seed sprout potential of the plants," said Kohli. He claims that their experiments showed that parthenium vermicompost showed greater protein content and larger shoot length than normal vermicompost. Experts, however, say commercializing the process will be difficult because there will be toxic reactions while collecting the parthenium in bulk. Such issues can be taken care of by using masks and gloves, says Kohli.